This voucher is redeemable for a $21 BART ticket upon arrival at SFO. Enjoy a traffic free round-trip train ride from SFO to either of 4 downtown San Francisco BART stations. Use this ticket to take BART from SFO to downtown Oakland or Berkeley, for a fast, easy, traffic free ride if you're staying in one of these cities. Most downtown SF hotels are located within easy walking distance of 4 downtown BART stations. You can also take BART to/from downtown attractions by adding fare to the ticket. Take more trips on BART by adding more value to your $21 BART ticket at any BART station ticket machine. Cash, Visa, Mastercard and Amex can be used. Your all electric BART ride from SFO to downtown SF keeps 10.2 lbs. of carbon or more out of the air. 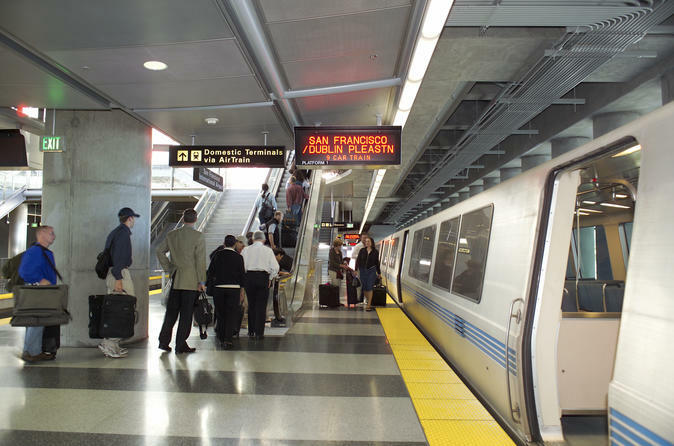 BART is quick, easy, and traffic free: 3-4 trains every hour from SFO. Ride to downtown SF in just 30 minutes. Avoid congested Bay Area traffic by purchasing a voucher redeemable for a $21 BART ticket for your airport transfer on your trip. Most downtown SF hotels are located within easy walking distance of a BART station (Civic Center, Powell, Montgomery and Embarcadero). The Moscone Convention Center is also a short walk from the Powell and Montgomery stations. In addition, there are several famous attractions along the downtown BART line; including Museum of Modern Art, Asian Art Museum and the Ferry Building. Your $21 BART ticket will have enough value for a round trip BART ride from SFO to Downtown San Francisco, Downtown Oakland or Downtown Berkeley, plus a small balance you can easily upgrade for additional BART rides anywhere in the system. If you need to add more value to your BART ticket, you can do so at any BART station Ticket Machine. Ticket Machines accept cash, Visa, MasterCard, Discover and American Express.